Pizza Hut, the world's largest pizza restaurant, is banking on the fact that people eat with their eyes. People want to eat something that looks delicious, and pizza tastes as delicious as it looks. Using this visual appeal to its full advantage, Pizza Hut Express locations, which are the non-freestanding Pizza Hut restaurants—found on university campuses, airports, retailers and highway rest areas—are starting to embrace digital menu boards. These Express locations are owned by franchisees and have a different and smaller menu than traditional Pizza Hut restaurants. In a partnership with Deel Media, a company that specializes in digital merchandising products and solutions for foodservice-centric venues, Pizza Hut is offering a digital menu board option for its franchisees. Each franchisee is presented with the costs for static menu boards versus digital menu boards, the cost savings with static and the benefits of digital. These days, franchisees understand the value of digital signage, and it is fast becoming their preferred option. So far, approximately 60 out of 2,500 Pizza Hut Express locations use digital menu boards. As the menu boards prove their profitability, Pizza Hut Express management expects more franchisees will invest in this option. A typical digital menu board installation includes up to five 42-inch LG monitors that are linked to a computer that remotely connects to a Deel Media server. Deel Media manages the content. It can push and edit the content to any Express location through a secured network. When it comes to driving customer sales, a static menu board just can’t compare with a digital board, especially for an item like pizza, which shows extremely well. “A hamburger or a wrapped burrito just doesn’t show as well as a freshly baked pizza on video,” said Doug Terfehr, director of public relations for Pizza Hut at Yum! Brands. Imagine a freshly baked pepperoni pizza; the bold red pepperoni on top of a layer of warm, melted mozzarella cheese, and don’t forget that chewy golden crust. Picture the steam rising off the pizza. As a slice is being pulled from the pie, long strings of cheese trail behind. Then, there’s warm, soft breadsticks being dipped in hearty marinara sauce. Pizza Hut Express is hoping such videos, displayed on their digital menu boards, will lead to increased revenue. Determining the perfect amount of movement and how the menu boards work in tandem—drawing a customer’s eyes to different boards at different times—is an art form. According to St. Clair, the ultimate goal is for the digital menu boards to allow the food to be the hero, so the food sells itself. Pizza Hut Express locations have a unique competition market. Consider the various types of offerings in a typical mall, airport or college campus food court. There’s Chinese food, hamburgers, pretzels and hot dogs, to name a few. In addition to other pizza restaurants, Pizza Hut Express locations must compete with all those companies. With this in mind, the company’s strategy is to let the products speak for themselves. The products are showcased with minimal text. As a hungry customer surveys his or her food options, Pizza Hut Express is hoping to catch the customer’s eyes with gorgeous videos of its offerings. At Yum! Brand’s headquarters in Plano, Texas, a central management station allows staff to view any Express location’s live menu boards. Mostly used for quality control and training, seeing the actual live menu board is incredibly valuable. Deel Media’s headquarters in Atlanta has the same capability. Staff can ensure live menu boards are accurate as well as make any changes such as pricing and adding or removing new deals and promotions. Last year, Pizza Hut awarded Deel Media its Partner of the Year award. When Pizza Hut Express turned to Deel Media for a complete, turnkey digital signage solution, Deel exceeded Pizza Hut Express’ expectations. In addition to helping Pizza Hut Express completely redesign its digital menu boards, Deel Media helped standardize and streamline processes for different menu-item types and deliver creative elements. For visually stunning digital menu boards, Deel Media worked with the Pizza Hut Marketing team to produce the still and animated images needed. With the assets acquired, the digital menu board designs finalized and processes in place, Deel Media was ready to distribute the content to the franchisees. The content is currently managed and edited by Deel Media using software called Carbon. The software processes any menu changes, such as adding and removing items and price changes. There are a lot of digital signage companies out there, but it is Deel Media’s focus that sets them apart. Pizza Hut Express is now adding military bases to the types of environments they serve. 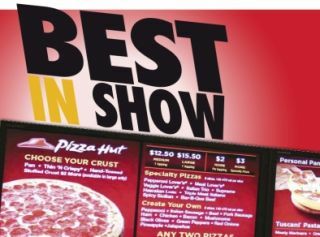 DEEL Media and Schult Industries, a provider of decor signage, menu systems and displays, are installing Pizza Hut digital menu boards at U.S. military bases around the world. The digital full-motion menu boards consist of six vertically mounted LCD displays. The Army & Air Force Exchange Service (AAFES), which works to deliver quality goods and services at competitively low prices with superior service to the military community, believes in the power of digital signage to drive sales and gain consistency of message and branding. “We’re excited to be a part of this project with Schult Industries, LLC, and are proud that our technology is being used to provide ‘a little slice of home’ to our military,” Clapes said in a press release. Pizza Hut Express has been interested in digital signage for a long time, but price was an obstacle. “Five years ago, the technology was much more expensive,” Light said. “So, it was a challenge, but even back then, we had the vision to look at this and say, ‘I can see where this is going and the power of it.’ We have to prove the profitability of it, but I don’t see how you can look at it and not think there is a huge amount of sales and power for branding. Having the buy-in of these 60 franchisees is a great step forward, and the folks at Pizza Hut Express are excited about its digital signage progress. And with Deel Media by their side, Pizza Hut Express can look forward to a future that includes a proliferation of digital signage.